It's kind of ironic - or maybe not - that the last time I did a W.i.P. Wednesday post, our home was entering a stage of unrest, so to speak, in the form of a new flooring project. Finally, finally, by last night the work was done, the furniture moved back where it belonged, and the last box unpacked, just in time for the first Thanksgiving houseguests to arrive. So six weeks later the relief is palpable, as you might expect, and in spite of the upheaval, I'm pleased with what I've managed to get done. Most of the finished projects have had their own post, so I'll just link to those in case you missed them the first go-round. Mini Quilt Swap project - This was a super fun experiment and my partner seemed to like it. And I'm happy that due to my over-zealousness in crazy-piecing, I have lots of bits to work into another project. Pillow Trio for mom - These were great fun to make. Mom chose the fabric, the pattern, and the quilting designs. At 20" each, they make a statement, and boy do they look great on her couches. 'For Pleat's Sake' Tote - Totes aren't a frequent project for me, but I had special fabric for this one, and with it being my first use of leather handles, it was a nice adventure. Let's say I've been carrying it every day since. November bee blocks - Enough said. Enjoyed them and they are all mailed off. Yay. Matchstick-quilted mug rug - One night I just had to drop everything and do this. Small yet satisfying, I can't wait to do it again. Lined drawstring gift bag - This probably didn't get a mention in a post, but that doesn't mean it wasn't pretty, pink, and perfect for grandgirl's birthday present. City Sampler Quilt Along - I've managed to keep up with the weekly blocks and they continue to be a pleasant diversion every time. Here's a few of my favorites made during these last few weeks. Binary quilt challenge for SMQG - The deadline is just 10 days away, so this is going to be tight. I'm just over one-third of the way into the quilting. Here's a peek of the center panel that is quilted. If I have any moments at all to sneak into the studio over the long weekend, this is what I'll be working on. * SMQG Christmas swap gift - Also need to have this done by 12/7/13. Yikes. * Polaroid Quilt - On my FAL Q4 list, I'm still hoping to get done by 12/31/13! Linking up with W.i.P. Wednesday at Freshly Pieced. 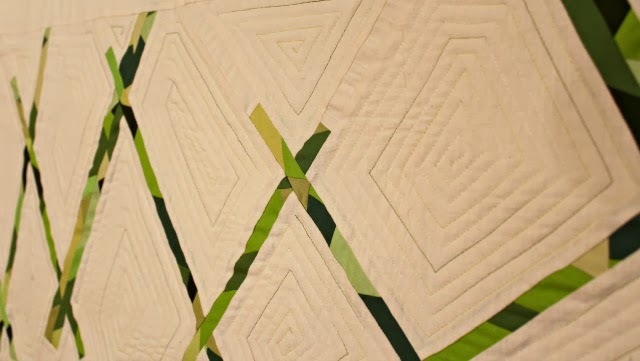 Love the sneak peek of your Guild challenge quilting, hope you find the time to get it finished for the deadline! Looking forward to a full reveal of that guild project! Looking good! Enjoy your Thanksgiving. Oh I love your yellow and brown block from your City Sampler. And hooray for the flooring being finished! Happy Thanksgiving, I am so glad your floors are all ready too. It Just Keeps Coming . . .